This entry was posted on Monday, November 29th, 2010 at 10:26 am and is filed under National Security Agency. You can follow any responses to this entry through the RSS 2.0 feed. You can leave a response, or trackback from your own site. 21 Responses to A Pearl Harbor Conspiracy? Not that I’m complaining, but sluggish loading instances times will very frequently affect your placement in google and can damage your quality score if ads and marketing with Adwords. Well I am adding this RSS to my e-mail and could look out for much more of your respective exciting content. Ensure that you update this again soon. So any learned person who listens knows that there is more to 9-11. That the terrorists weren’t in Iraq, etc. That we had warnings since the 80’s. Pearl Harbor was also somewhat of a conspiracy. The President made a plan to intentionally provoke Japan into “striking first” so that the U.S. could enter war with Europe (which citizens were opposed to). What’s another government lie, with about equal standing and importance of these ones? 5) BP oil spill is inside job. 6) All missing people have been abducted by UFO’s. Thanks for the above, 9/eleven was inside of work whose mastermind was Bush. Pearl Harbor was within employment whose mastermind was FDR. Japanese ended up innocent and unnecessarily suffered two atomic bombings. Federal government conspiracies keep going to this day. The most modern example of government conspiracy remaining Toyota recall of unintended acceleration considering the fact that Authorities Motors was struggling. Swine Flu vaccine was a further modern govt conspiracy and so is the up-to-date economic downturn which commenced in December 2007. The moon landing was a hoax very. I am a effectively educated gentleman with degree in mathematics, so i am not ignorant. Regarding the controversy about FDR’s advance knowledge and intent, we very often confuse the general knowledge of the overall situation before an event as proof of specific knowledge of the event. We knew we were inching toward a fight with Japan as a result of the embargo and there was an expectation (based on Japan’s prior military actions) that it would be a surprise attack on a holiday or other period of stand down. It was expected that the strike would likely be against a key base in the Western Pacific (like the Philippines) not against our bases outside of the expected theater. I remember speaking with a retired CG Captain in the 1990s who was a USNR Ensign on a destroyer in the Atlantic in ’41. He said the news of the Pearl Harbor Attack was more of a shock than a surprise. At the same time, the U.S. was already at war – with Germany in a naval war that had been raging since the summer. FDR probably didn’t need an excuse in the Pacific for an expanded war against Germany – all he needed to do was wait for matters to deteriorate further. Allowing the Pacific Fleet to be devastated was not in FDR’s interest regardless of what side we ended up fighting and it doesn’t make any sense. At the time of the attack, battleships were still viewed as the primary weapon (not the aircraft carrier) and Kimmel’s battle plan for taking on the Japanese fleet anticipated a big gun duel in the mid-Pacific (which is also what most of the Japanese admiralty expected as well). FDR was primarily concerned about Hitler and there was no guarantee that a war with Japan would lead to a war with Germany (at this point, Japan had declined to join its Axis partners against the U.K. and the U.S.S.R.). As it was, Germany’s declaration of war on the U.S. was an act of Hitler’s hubris as opposed to any treaty obligation. I think we tend to look for conspiracies in something like this because we think that we should have been able to stop something like this. The reality is that the key to victory was the audacity of the plan and the technical excellence of the Japanese Navy in pulling it off, coupled with a too-conservative assessment of Japan’s capabilities and a confused analysis of the mounting threats by the U.S. commanders. I tend to agree that President Roosevelt was inclined to wait for something to happen that would help him to rally the American people and gain support for assisting England. I’m not so sure he suspected the scale of the attack would be as large as it was, considering that the Japanese were aware of our capabilities to some degree. The Japanese Admiral knew enough to comment that he feared all they had accomplished was awakening the sleeping giant. I do hope we are not sleeping as much these days. 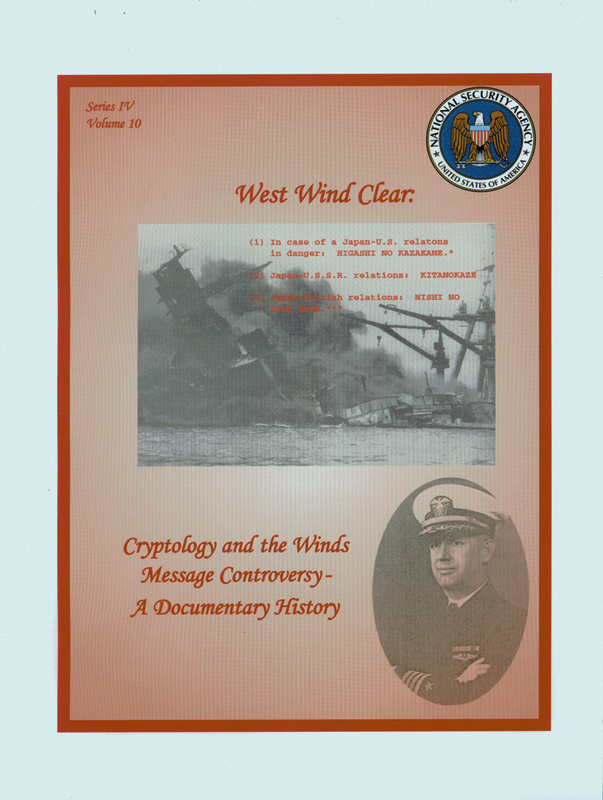 Thanks for this reference on the “Winds” messages; I’ll check it out. More to the point might be a German intercept, via a radiotelephone listening/descrambling post on the Dutch coast, of a 26 November 1941 conversation between FDR and Churchill discussing the upcoming Japanese strike at Pearl Harbor in some detail; evidently the British were quite a bit ahead of the U.S. when it came to decyphering the IJN code. For documentation and discussion, see Gregory Douglas, GESTAPO CHIEF- THE 1948 INTERROGATION OF HEINRICH MUELLER, Vol. I, pp. 42-55, 246-252. My father was stationed at Hickam on 12/7/1941. I learned this in Third Grade when our teacher read his interview for the 15 Anniversary of the Attack. She left out his name and then announced “This young airman’ son is in our class today” and it was ME! That night at supper I asked him if it was true and he was as surprised as I had been for me to ask. I had his interview if anyone wants to read it. At the very end he states ” I just hope they never allow this to happen again”. On 911 I was sitting aside of my Uncle who also fought in World War Two and he said much what my father had said. “THIS WAS NEVER SUPPOSE TO HAPPEN AGAIN” after Hickam and Pearl Harbor. It did happen again and it will again with the people we have in Washington trying to run our country. OF COURSE I AGREE!IN FACT , THE ACTUAL “WEST WIND EXECUTE” MESSAGE WAS BROADCAST AFTER THE ATTACK BEGAN!IN MY OPINION , THE AMERICAN GOVERNMENT HAD MANY OTHER EVIDENCE , ABOUT THE IMMINENT JAPAN’S ATTACK ON PEARL HARBOUR!AND I HAVE A QUESTION ABOUT THIS STORY:WHERE WERE THE AMERICAN AIRCRAFT AT THE MOMENT OF ATTACK?THE AMERICAN AIRCRAFT JUST ABSENT! We are talking about the conspiracy in favor or against the war?. Ordinary people, including senior military, ignored and should be ignored for the purpose of war and therefore the mechanism of the conspiracy. However, all join efforts to win the war. Good day, Back then they or we did not have the technology to give Pearl Harbor the Proper Warning until they were right up on US. There was no conspiracy to speak of except that we were to big and mighty and didn’t think that anyone was big enough to challenge our Military Muscle…. I could be wrong but You only Live Twice…..
I’m not so sure the problem was the technology but rather the lack of an ordered process for assessing threats, communicating, and taking responsive action. We’re used to the “DefCon” approach that heightens readiness as the perceived threat increases. Back then theater commanders had the responsibility to respond to threats within their discretion (hence the deriliction charges against Short and Kimmel and their defense that the latest “war warning” before the attack was indistinguishable from previous warnings). I think the DefCon structure was developed during the Eisenhower Administration. Thanks for this interesting post. I checked the GPO Catalog to see if my local depository library had this title. Please note that it was not distributed in print to any depository. It is available electronically via the depositories that subscribe to the item no. which covers this publication. A depository would have had to purchase this title. I had difficulty locating this title in the GPO bookstore. fyi. I’m glad you enjoyed the post.To my knowledge, this publication has never been sold by GPO. It is available at no cost from the publishing agency — there is a link in my post. I will forward your inquiry about print distribution to depository libraries to my colleagues on that side of the house.